There are many different parameters that are regularly measured in different industrial processes. Some of these are temperature, moisture content, strength, material content, texture, and color. Perhaps the most important is weight. This parameter is used when different components must be mixed together to achieve a desired result. It is also used for dispensing and packaging. Shipping and receiving is another area where weight information is critical. A wide variety of different kinds of industrial scales are the type of instrument which is used to measure the weight. These include platform and floor scales for larger types of boxes and containers. Crane scales are used for loads that may be suspended. Drum scales are generally used for pails, smaller tanks, dewars and standard size drums. For smaller items, bench scales are more appropriate. Laboratory scales and precision scales are used for the most accurate measurements. All of these different types of scales rely on the transducer device which converts a force into an electrical signal. This device is often called a load sensor, or load cell. Larger floor scales and platform scales often use four load cells in each scale, one in each corner of the platform. Smaller scales most often only include a single load cell. The electrical output from most standard load cells are very small, millivolt level signals. Higher quality industrial scales compensate the load cells for temperature, so that the output signal remains quite constant for a given load. The output is often buffered and then directed to an analog to digital converter for processing by the scale before being displayed for the user. Load cells may be built in a wide variety of different shapes and sizes, depending on the type and size of scale. Most larger platform scales use beam load cells that measure a level of shear. Bench scales may use single point load cells that measure strain. In both cases, thin sections of metal are supported by larger metal frames. The entire device is designed to act as a spring element. Strain gages are adhered to the thin metal sections. These gages measure either shear or strain, and thereby determine the amount of the load on the load cell. Those load cells that are designed for large platform scales must have thicker bending elements and a larger support structure. That is also the case on the single point load cells. Ideally, the load cell will act as a perfect spring. When a load is placed on it, the amount of output will be perfectly proportional to that load. When the load is removed, the load cell should return perfectly back to its initial position. Furthermore, the load cell should not be affected by temperature changes, or other environmental conditions. Unfortunately, there is no such thing as a perfect spring element. Some things which affect the spring properties include the choice of metal used, the shape of the load cell, the manner in which the load cell is manufactured and the heat treating process of the metal after manufacture. Probably the most important of these is the type of metal used. There are a number of alloys of aluminum, steel and stainless steel that are considered to be standard. Each of them has benefits and disadvantages. A major advantage of aluminum is that it is easy and inexpensive to machine into the desired final shape. For this reason, it is the most popular choice for bench scales and other lower capacity industrial scales. But it has fairly high temperature coefficients. It is also most prone to deformation due to shock and overloads. 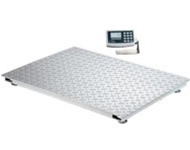 Steel is also widely popular, especially for digital platform scales and digital floor scales. The material itself is considerably less expensive than stainless steel. It is also much easier to machine than stainless. But because of the corrosion properties, steel load cells must be nickel plated. This material is also not as rugged as stainless steel. Generally, the highest quality scales, such as the Arlyn brand of Industrial Scales, will use stainless steel for the load cell. The most popular alloy choice is known as 17-4 precipitation hardened material. It has excellent spring properties, and has good corrosion resistance. But the heat treating process must be carefully regulated, adding additional cost. It is also a difficult material to machine.